Wyoming, admitted to the union in 1890 as the 44th state, is located in the mountain region of the western United States. Wyoming is the 10th largest state in the nation at 97,814 square miles (253,348 km2), but the least populous (568,158 - 2011 estimated) and the 2nd least densely populated (5.85 persons per square mile) of the 50 states. The western two thirds of the state are covered mostly with mountain ranges and rangelands in the foothills of the Eastern Rocky Mountains, while the eastern third of the state is high elevation prairie known as the High Plains. Cheyenne is the capital and the most populous city in Wyoming with a population of nearly 60,000 within its city boundaries proper. Wyoming was originally inhabited by several American Indian groups, including the Crow, Arapaho, Lakota, and Shoshone. 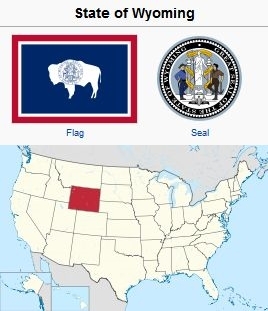 What is now Wyoming was ceded to the United States in 1848 and it became the 44th state on 10 July 1890. Wyoming is known as "The Equality State" because it was the first US state to grant suffrage (the right to vote) to women. It was the first state to elect a female governor, Nellie Tayloe Ross, in 1924. Mining and tourism are the most significant economic activities in the state. Wyoming is home to Yellowstone National Park, the world's first national park. Agriculture is also an important economic activity, with 91% of the state's land classified as rural. In 2005 just over 96% of the population was classified as White, 1.15% were Black, and 3.06% were American Indian. The largest ancestry groups in the state at that time were German (26.0%), English (16.0%), Irish (13.3%), American (6.5%), Norwegian (4.3%), and Swedish (3.5%). In terms of religious affiliation, 53% were Protestant (Lutheran – 8%, Baptist – 8%, Methodist – 6%, Presbyterian – 4%, Episcopal – 4%, Other Protestant or general Protestant – 21%), 16% were Roman Catholic, 11% were Mormon, and 18% were Non-Religious. In 1881-82 the Philip J. Yoder family, early settlers of Mennonite and Amish heritage originally from Shanesville, Ohio, moved from Henry County, Iowa, to the Bear Creek area in present-day Goshen County in southeastern Wyoming, about one mile (1.6 km) west of US Highway 85 and 12 miles (19 km) west of the Nebraska state line. The name "Goshen" is thought to be derived from an early trapper named "Goshe." By 1846 the name "Goshe's Hole" was applied to a rich farming area, and by 1888 it appeared on the map as "Goshen Hole." Philip prospered in raising cattle and horses. His Amish and Mennonite heritage was apparently discarded. In late 1905, after an absence of 42 years, Philip and his wife Cinderella traveled back to Shanesville, Ohio, to visit. Mrs. Yoder suddenly took ill and died, and her obituary appeared in the 11 January 1906, issue of The Budget, an Amish-Mennonite newspaper published at Sugarcreek, Ohio. Her remains were returned to Cheyenne, Wyoming, for interment. Four years later, Philip died on 28 July 1910. During Philip J. Yoder's lifetime, no town named "Yoder" existed. In 1921 the Union Pacific Railroad laid track from Gering, Nebraska, to South Torrington, Wyoming, the seat of Goshen County. The tracks passed several miles east of the Yoder ranch. Jesse Yoder, Philip's son, organized the Goshen Townsite Development Company to build a new settlement beside the railroad. The buildings from two tiny crossroad settlements, Springer and Lacy Corners, were moved to the new town site. The name "Yoder" was chosen in honor of the Yoder family which had lived in the area since 1881 and for Jesse Yoder, head of the townsite company. In four years' time, Yoder, Wyoming, grew to a town of 500-600 people, but its population declined significantly during the Great Depression of the 1930s. Benjamin F. Yoder, son of Philip J. Yoder, continued to oversee extensive ranching operations in the Bear Creek, LaGrange (a Goshen County town located about 25 miles (40 km) south-southeast of Yoder and named for Caleb LaGrange, an early homesteader), and Goshen Hole areas before dying in 1943 at the age of 80. The former Philip J. Yoder ranch was still owned in 1983 by Philip J. 's grandson, Oscar T. Yoder, who had purchased it in 1931. Oscar, who continued to live in the home built by his grandfather, served in the Wyoming state legislature for 10 years (1955-65), six in the house and four in the senate. During the World War I years (1914-18) the Chugwater Creek area of Platte County in southeastern Wyoming became the focus of a Mennonite-related colonizing effort. The Wyoming Development Company with headquarters in Chicago was established in 1883 and thereafter began construction of an extensive irrigation project in the valley of Chugwater Creek, a tributary of the Laramie River, that brought an influx of farmers to the promising new acreages around Wheatland, a town that became the seat of Platte County in 1911. One of the small towns that developed out of this influx was Bordeaux, named for James Bordeaux, an early French fur trader from Missouri who established a store in the Chugwater Valley in 1868. Bordeaux was located about 10 miles (16 km) southeast of Wheatland and 4.5 miles (7 km) north-northwest of Slater. During 1914-16 Carl B. (C.B.) Schmidt, a promoter of Mennonite immigration and western settlement expansion, was employed as a colonization agent for the Wyoming Development Company. In this capacity he carried on extensive correspondence with Mennonites, particularly Henry P. (H. P.) Krehbiel, a promoter of western Mennonite settlement expansion, in an endeavor to sell lands in the Wheatland area. Krehbiel, secretary of the Home Mission Board of the General Conference Mennonite Church (1914-23) and member of the Mennonite Immigration Bureau which he helped organize in 1906, was an original founder and director of the Mennonite Settlers Aid Society in 1918. Thus, Krehbiel opened a Mennonite colony in the vicinity of Bordeaux during the World War I years, but the effort had little long-term success. During the 1920s the Mennonite Church became interested in a large scale irrigation project in the Eden Valley of what is known as the Red Desert, a high altitude windswept desert and sagebrush steppe located in south central Wyoming. The Mennonite Church encouraged its members to move to the area to take advantage of the newly-irrigated lands, and the Mennonite pioneers established a small settlement some 38 miles (61 km) north of Rock Springs in Sweetwater County which they gave the idyllic name of Eden. Efforts to reclaim areas of the Red Desert for agricultural development date back to the 1880s when Wyoming Territory issued water permits for settlers to divert Big Sandy Creek, which drains into the Green River. The Eden Irrigation and Land Company completed a major irrigation project in the area during 1907-14. Under the provisions of the Carey Act each settler in the Eden Valley was allowed 160 acres of federal land, but was required to pay 50 cents per acre for the land and $30 per acre for its associated water rights. Payment was due in 10 years if settlers could irrigate at least 20 acres. The large scale water development project was financed by John M. Farson and Sons Company and consisted of a series of dikes on the Little Sandy and Big Sandy Rivers. To attract settlers to the area, promoters distributed pamphlets advertising advantages of farming in the Eden Valley. Claims proved to be exaggerated, such as "fruit orchards will thrive and corn will grow higher than a man's head" and "the growing season in Eden Valley is as delightful as can be found in the country anywhere." Lured by the promise of a prosperous new beginning, settlers started moving to the Red Desert. Most traveled on the Union Pacific Railroad to Rock Springs, bringing furniture, farm equipment and even animals with them in emigrant cars. They continued by wagon to Eden Valley. By 1926 some 45 miles (72.5 km) of canal and 110 miles (177 km) of laterals irrigated the fields of about 30 farmers in the Eden settlement. Instead of a Promised Land, the Mennonite settlers found that the windswept Red Desert area consisted of hard, brown desert ground that averages eight inches of precipitation a year, most of which was snow. Moreover, the Eden Land and Irrigation Company went bankrupt in 1923, and in 1927 the project was sold to the Rock Springs Water Company, who resold it to the Wyoming Land and Water Company in 1932. Later in 1940 the Civilian Conservation Corps, under the administration of the Bureau of Reclamation, began work on the Big Sandy Dam. As a result of these problems, as well as the effects of the Great Depression, the Mennonite colonizing effort struggled and ultimately failed. The 19 October 2009 issue of the Mennonite Weekly Review reported that there were three Mennonite congregations in Wyoming with a total of 92 members. The two largest congregations were the High Prairie Mennonite Church in Carpenter (founded in 1991; 2010 membership -- 52) and the Rawlins Mennonite Church in Rawlins (founded in 2002; 2010 membership -- 30). Both congregations are denominationally affiliated with Nationwide Fellowship Churches. The third was a Church of God in Christ, Mennonite congregation, with 10 members, in Washakie County. Cooper, Craig D. A History of Water Law, Water Rights and Water Development in Wyoming, 1868-2002. June 2004. Web. 27 January 2012. http://wwdc.state.wy.us/history/Wyoming_Water_Law_History.pdf. "Eden Valley, Wyoming." Web. 22 February 2012. http://www.edenfarsonhistory.com/history/htm. Luthy, David. "Yoder, Wyoming." Yoder Newsletter Vol. 1, No. 2 (October 1983). Web. 26 January 2012. http://www.yodernewsletter.org/ynlpdf/YNL2.pdf. "Mennonites in the United States." Mennonite Weekly Review (October 19, 2009): 12. The Museum of the Fur Trade. "The Bordeaux Trading Post." Web. 27 January 2012. http://www.furtrade.org/2brdx.html. Nelson Engineering. "Final Design Report Big Sandy Water Supply Project, Level II, Wyoming Water Development Commission." October 1993. Web. 9 February 2012. http://library.wrds.uwyo.edu/wwdcrept/Big_Sandy_River/Big_Sandy-Water_Supply_Project_Level_II-Final_Report-1993.pdf. Platte County, Wyoming. "History of the Community." Web. 27 January 2012. http://www.wheatlandwy.com/history.htm. Wikipedia. "Red Desert (Wyoming)." Web. 22 February 2012. http://en.wikipedia.org/wiki/Red_Desert_(Wyoming). Wikipedia. "Wyoming." Web. 4 March 2012. http://en.wikipedia.org/wiki/Wyoming. Unrau, Harlan D. "Wyoming (USA)." Global Anabaptist Mennonite Encyclopedia Online. February 2012. Web. 25 Apr 2019. http://gameo.org/index.php?title=Wyoming_(USA)&oldid=114443. Unrau, Harlan D. (February 2012). Wyoming (USA). Global Anabaptist Mennonite Encyclopedia Online. Retrieved 25 April 2019, from http://gameo.org/index.php?title=Wyoming_(USA)&oldid=114443. This page was last modified on 28 February 2014, at 08:35.